We tagged TTOO as a bottom play just under a month ago in our report dated July 18th, as the stock was undergoing a lengthy period of consolidation. It subsequently found support at 2.53 shortly thereafter, and since that point in time, it has seen a solid recovery off of those lows. Yesterday, TTOO reached a new high of 4.07, its best PPS all summer long. It worked out to a very respectable 61% upswing over our observed low, and indicators on the chart suggest there is still room for more rapid short term growth, so we’ll continue to keep an eye on this play moving forward. The markets ended up rebounding yesterday, leading us to note our interest in tracking the SPY Weekly $244.50-246 Calls in the event that the premarket trend we were noticing continued into the session. That’s what happened, and as a result our highlighted contracts made some really nice intraday moves. The possibility of a sustained rally for the markets will lead us to roll up our potential strike prices in the SPY chain up to the $247 and $247.50 Calls to potentially keep this idea rolling. We first caught wind of ZRZH last year, and it was good to us back then. We want to revisit the stock once again today for a couple reasons. Not only is ZRZH in a relatively good place on the chart from which to launch a possible rebound, but yesterday the company presented some impressive quarter-over-quarter revenue growth. 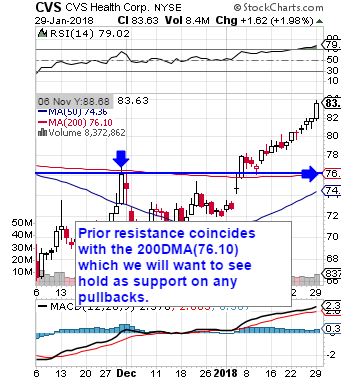 For those reasons, we want to place this stock on watch this week, a rebound to its previous area of fierce resistance at a nickel would mean considerable gain opportunities from present pricing. After initially tagging CNXS on Thursday May 25th amid a major spike of bitcoin hysteria, we witnessed a low of .0007 in the stock, and in the six sessions that have followed it has been building up quite a head of steam. From that initial observed low, CNXS has gone on to hit a high of .003. which represents a very nice move of 329% while volume over this recent period has been heightened considerably. We’ve been noticing a few other newsletters finally catching on, but to our knowledge we were the first to the party on CNXS. We’ll continue to monitor its progress moving forward, and will remain interested provided it holds support at or above a previous area of resistance at .0018 on any pullbacks. After sitting on the sidelines for many months on FIT, and watching the stock get crushed, we’ve seen it beginning to come up off of its recently established 52-week lows and are beginning to see it as a potential value play. If our inkling is correct, a play of FIT stock itself would likely work out rather well over the longer term, but as our readers are aware, we like to try to score big with options plays when an opportunity presents itself. In this case, we’d like to signal a range of extended-term contracts with an August expiration, namely, the FIT 08/18 $5-7 Calls. This will give us plenty of time for FIT to restablish itself and hopefully mount the recovery that appears possible given the current look of the chart. Speaking of bottom plays, we’re noticing that CLSN has recently registered a new annual low on Wednesday, and has been attempting to gain some traction and come up off of that bottom. With the stock very close to extreme oversold territory, we’ll want to place it on watch as a possible rebound play. In Tuesday morning’s premarket report, we expressed our interest in PTBI based on some press, and the look of the chart. We expected to see a chance for a nice gain, but what followed has been much more impressive. Yesterday, the company came out with news of a new acquisition in the morning, and that certainly added fuel to the fire. After a gap-up we witnessed an early run from 8.71-11.15 (+28%). That high represented a two-day increase of 157% over our observed low of 4.33, and was followed by some consolidation in the afternoon leading to a close at 8.60. The company published another press release post-market divulging details of a forthcoming private placement (Link Below), that is untraded-upon. Thus, PTBI is gapping up once again today, so we will be wary of the possibility for more price action similar to what we’ve seen so far. 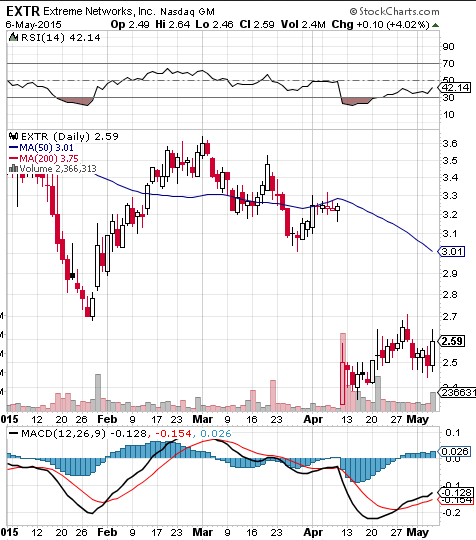 We’re going to put EXTR on our radars this week as a stock that was sent through the ringer after an analyst downgrade early last month, causing a big gap-down on the chart. You can see it plainly on the snapshot we’ve included below. In addition, we can identify a couple of bullish indicators staring us in the face; the RSI is coming off of being oversold, while the MACD is upturned and showing divergence. The stock has been making higher highs and higher lows for two sessions running, and we’ll look for that to continue. We also want to pay attention to GEVO after an interesting PR this morning that highlights an agreement with Alaska Airlines has sent the stock cruising to three-month highs in the premarket. The chance for a dip-and-rip style play could present itself on the rebound after the profit-takers come out of the woodwork early in today’s session. For us to remain interested in GEVO, the stock will need to maintain support at or above its 50DMA of 3.23 on any pullback. To start off a new trading week, we’re going to follow up on Friday’s mention of PBR Calls, which ended up with a fantastic performance by all accounts. 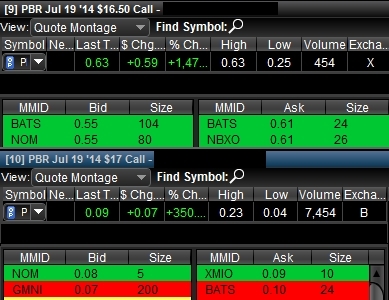 If you recall, in Friday Morning’s Report, we indicated that we were “interested in the potential of the $16.50 and $17.00 Weekly Calls” for intraday flip opportunities. The stock was searching for a base of support from which to launch its next upswing, and found it at .007 shortly prior to the close on Thursday. Friday’s session would prove most advantageous, as the stock sailed back upward to as high as .02, marking a 185% spike off of that bottom. That was the second golden opportunity presented to us by GEIG in as many weeks; remember, we called it the week before last as well, and were rewarded with a single-session move of over 700% with traders easily being able to play the stock for gains in the 400% range. The high on that run was .08, so its quite possible to see GEIG make further strides from current levels. We’re still monitoring FB Calls as we pointed out at the beginning of last week. We’ll be looking to capitalize on the volatility that comes with rising anticipation of earnings, due for release on Wednesday. It won’t be the first time we’ve used this tactic, and it isn’t likely to be the last. In the midst of earnings season, we’re focused on using the trends to our advantage in making some potentially big options trades, not just with FB, but many others as well.